Old School Ron: New trading policy at Channel Fireball GPs? New trading policy at Channel Fireball GPs? 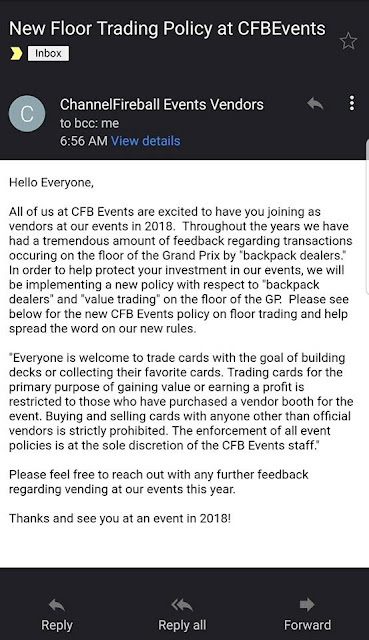 An interesting notice has been circulating around Facebook today coming from Channel Fireball concerning a new "floor trading policy" at their Grand Prix events. 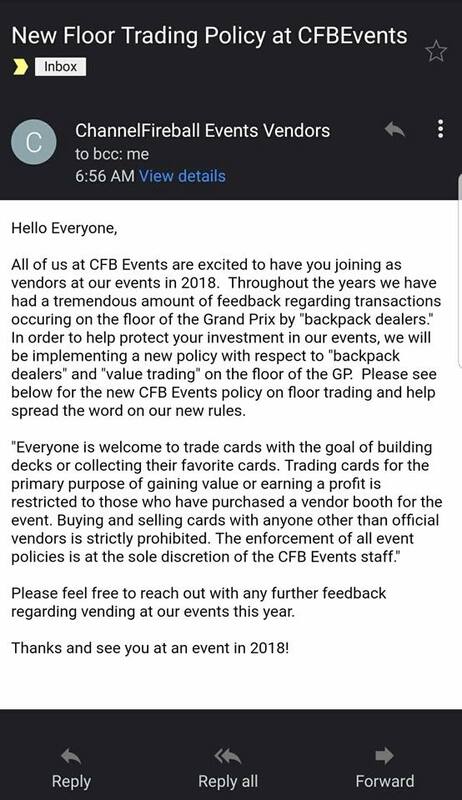 While I visit most larger events mainly to get my cards signed, I find this new policy interesting, but not at all surprising from a business standpoint. I know that trading used to be the way to get cards years ago. If you didn't trade, you probably weren't going to get the cards you wanted most of the time. Your friends often had a far bigger selection of cards than most stores it seemed back then. Going to events meant you had access to even more players outside your normal group resulting in a much larger pool of cards to trade for. Being an Old School Player these days, I don't trade that often, but I'm curious as to why this came about. It makes sense that Channel Fireball is going to make decisions that are in their best interest financially, but I wonder what the catalyst was for this. Was it a single incident or a slow buildup of smaller issues over time that finally resulted in this ruling? To be honest, I didn't know this was that big of problem that a policy needed to written and pushed out to the public. So if I'm reading this right... no more trading "for gaining value or profit" unless you're trading with an approved vendor at the event? Interesting. I like how it's described as "protecting my investment." How as an organization do you go about enforcing something like this? There seems to be some grey area there and I'm sure that if you were confronted, you could simply claim you were trading to "build your deck" or just "collecting your favorite cards." I wonder how many cards you can "trade" then before you draw unwanted attention. Better yet, how much money does it cost to become an official vendor? In the few events I have been to, I almost always saw people doing this very thing with each other. Someone happens to have a card you want/need and is willing to part with it... and you have a bunch of cards you no longer want and are willing to let go at below value to get the one particular card you want... you start haggling like two street market vendors over the last piece of fruit. If I understand it correctly, it's called the "pack to power" trade where a player will trade a large number of cards (lower in value) in to get a few key power cards (higher in value). They're often more than happy to get rid of a ton of cards they aren't using anymore in attempt to get or put money towards getting those one or two much higher value cards they would use on a regular basis. It'll be interesting to see how this policy plays out in the coming year and if it has the impact they are looking for. UPDATE: I've reached out to Channel Fireball for some clarification on this and will update the post if and when I hear back from them. IMAGE: WotC. 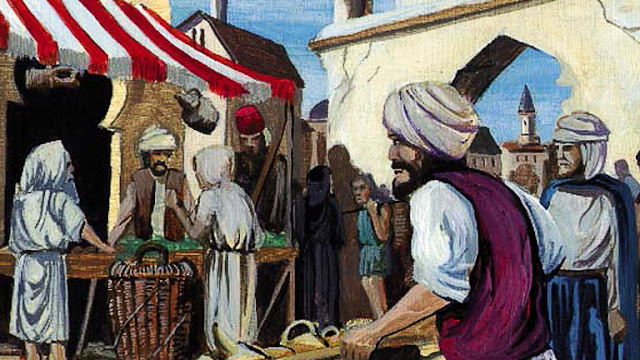 Artwork from Bazaar of Baghdad by Jeff Menges.